Above: Celebrity Solstice has a hydrodynamically designed hull for greater speed. Below: Captain Panagiotis Skylogiannis has commanded Solstice and her sister ship Celebrity Eclipse. Holland America's Rotterdam (above) was designed by Stephen Payne who also designed Queen Mary 2. The giant Allure of the Seas has gone nearly 25 knots. A class of ships that attributes its speed to innovations in hull design rather than the power plant is Celebrity Cruises’ Solstice class. Celebrity officially lists their speed as 24 knots. 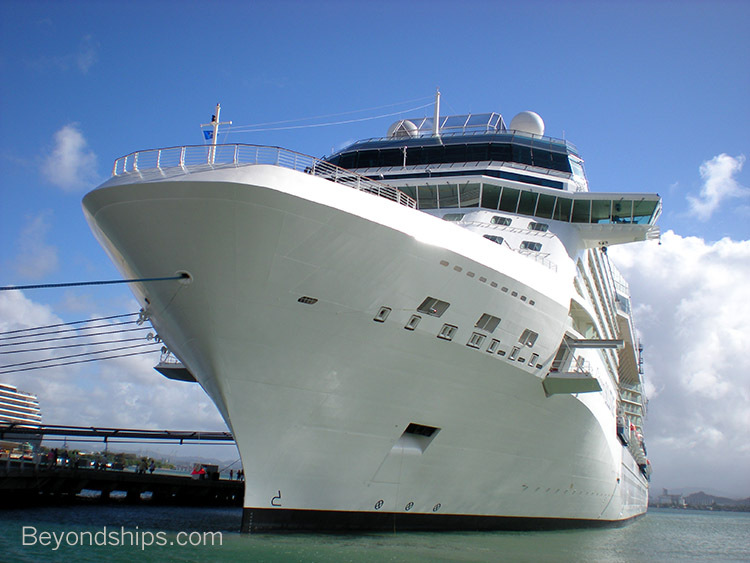 However, Celebrity Solstice reportedly has achieved 25.6 knots. The new Disney Dream reportedly has a maximum speed of 24.7 knots. All of the aforementioned ships except Queen Mary 2 were built by the Meyer Werft shipyard. However, other yards are also building faster ships. Built by Fincantieri, Holland America’s Rotterdam lists her maximum speed as 25 knots. Perhaps more surprisingly, the giant 220,000 gross ton Allure of the Seas built by STX Europe did 24.36 knots during her sea trials. “It always amazes me that such a large ship can be so fast and nimble,” confides Richard Fain. .
Once you get to ships that list 24 knots as their maximum speed, the field widens considerably. There you will find ships such as Norwegian Dawn and Norwegian Spirit, P&O Cruises Aurora and Oriana, Carnival Miracle and Carnival Legend, Celebrity Constellation and Celebrity Summit, Disney Magic and Disney Wonder, Queen Victoria and Queen Elizabeth and the Holland America Vista and Signature classes. Interestingly, not all sister ships claim the same maximum speed. For example, Noordam lists her top speed as 24 knots while Westerdam claims only 23. Whether this is because of rounding or because of the individual characteristics of the ships, I do not known. To provide a fame of reference, the fastest major passenger ship the United States’ record breaking Atlantic crossing was at an average speed of 35.59 knots - - considerably faster than any ship in service today. However, the fastest of today’s cruise ships would be able to match Mauretania’s fastest Blue Ribband speed (26.25 knots) and QM2 could in theory surpass the speeds of such notables as Breman, Europa and the Rex. So the ships of today are not as fast as the top greyhounds of yesteryear. However, today’s ships are faster than the cruise ships of just a short time ago and some are achieving quite respectable speeds. While the cruise lines struggle to reduce fuel consumption, there are reasons to build speed into ships - - avoidance of bad weather, emergency situations, and to enable the ship to do more attractive itineraries. As hulls and power plants are made more efficient, we can look forward to seeing more fast ships in the future.